The Panasonic 14-42mm ƒ/3.5-5.6 ASPH MEGA O.I.S. Lumix G Vario is an update to the original G1-system kit lens, slightly smaller and lighter, and with a 3mm reduction in its longest focal length. Actually introduced with the G2, we didn't have an opportunity to test it when we reviewed that camera, but received a copy of this lens with the new G3 body. The new design removes the exterior switch to control image stabilization, making it controlled completely from the body; as well, it employs the newer continuously variable aperture, used to great effect in movie mode. The 14-42mm ƒ/3.5-5.6 was designed exclusively for the micro four-thirds sensor size; it's not clear whether the lens could be mounted on other Panasonic models with an adapter, or even if you would want to. The lens offers focal lengths equivalent to 28-84mm, in 35mm film terms. The lens takes 52mm filters, and ships with the H-FS014042 petal-shaped hood. The lens is available as part of a G3 camera kit. The Panasonic 14-42mm produces decently-sharp images when used at its widest aperture - better in the wide angle than at telephoto - but stop down even just to ƒ/4 or ƒ/5.6 and images are very sharp indeed. Used wide open at wide angle (14mm @ ƒ/3.5), there's a generous sweet spot of sharpness in the center, which is surrounded by light softness out to the edges. Interestingly, stopping down to ƒ/4 actually produces slightly worse sharpness - noticeable at the top of the frame - before becoming steadily sharper at ƒ/5.6 and tack-sharp at ƒ/8. Diffraction limiting sets in at ƒ/11, but you won't notice it until ƒ/16 or even ƒ/22. Zooming in a bit into the mid-range (18-25mm), the lens shows some light softness when used wide open, particularly at the top of the frame; otherwise, there is some generous sharpness. Stopping down to ƒ/5.6, especially at 18mm, where it becomes tack-sharp, improves this performance. At ƒ/8, it's tack-sharp across the board, echoing the performance noted at the wide-angle setting, previously. Used in the lens' telephoto range (36-42mm), the wide-aperture setting is above-average, but not excellent. To get any real sharpness you'll have to stop down to ƒ/8, where it's like someone flicked a switch and the sharpness turned on; results are almost tack-sharp across the frame. Again, this excellent performance continues all the way to ƒ/16, and then there's only light softness at ƒ/22. Results for chromatic aberration testing were slightly higher than we'd prefer, mostly in the corners, but actually visible to some degree even in the centre. CA takes the form of magenta-blue fringing at edges of high contrast, and is more prominent when the lens is used in a wider aperture than a smaller one, so stopping down will minimize it to some degree (and provide you with sharp images, too). It's worth noting that we're pretty sure the Panasonic G3 does some image post-processing to alleviate CA, shading and distortion. The most significant corner shading is produced at the widest angle and widest aperture setting: when set to 14mm and ƒ/3.5, the extreme corners will be 3/4 of a stop darker than the center. Otherwise, it's not so bad; other focal lengths when used wide open produce about a half-stop differential. Stopping down reduces this shading considerably, until at ƒ/8, there is no shading to speak of. We know there's some complicated post-processing under the hood of the G3 when we see its results for distortion; there hardly is any, especially between 18mm and 25mm. Otherwise, there is some very light barrel distortion at 14mm, and some very light pincushion distortion at 42mm. The Panasonic 14-42mm ƒ/3.5-5.6 is very quick to autofocus - the lens takes well under a second to slew through the entire range of focus. Small changes in focus are conducted extremely quickly, and there's very little noise when the lens focuses. Macro performance is above average, with a 0.3x magnification rating and a minimum close-focusing distance of 30cm (around one foot). 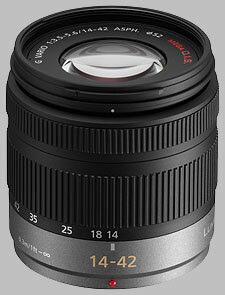 The Panasonic 14-42mm ƒ/3.5-5.6 lens is quite small and light, weighing in at just 165gm (just under six oz). This is 30gm lighter than the previous G-series kit lens, the 14-45mm. One must assume there is a bit more plastic in the lens to achieve this weight savings, as the lens uses the same optical formula as the previous 14-45mm lens - 12 elements in 9 groups, with a single aspherical element. The lens uses the same seven curved diaphragm blades to make up the aperture, but the metal body mount has been replaced with a plastic one. Where the 14-45mm lens used to have a switch on it to enable or disable the Mega O.I.S. image stabilization, this switch has been removed on the new 14-42mm lens, presumably because it was potentially confusing (Mega O.I.S. functions are controlled on the camera body). As well, there is no distance scale or depth-of-field scale on the lens; the only information is the focal length markings. The focusing ring is plastic with raised ribs, just 1/4'' wide. The ring will rotate forever in either direction with no hard or soft stops. The zoom ring is also plastic with raised ribs, about 3/4'' wide. The zoom ring is smooth to turn, taking only two fingers to rotate, and offers around 80 degrees of turning action to run through the available range of focal lengths. There is some lens extension as the lens is zoomed in towards 42mm, about one inch. Zoom creep is not a factor with this lens. The lens hood is a petal-shaped, bayonet-mounted design that is 1 1/2 inches long, adding about 1 1/4 inches when attached. The hood will reverse for storage on the lens. Panasonic 14-45mm ƒ/3.5-5.6 ASPH MEGA O.I.S Lumix G VARIO ~$? The previous kit lens, which this model replaces. The 14-45mm is an excellent lens, slightly sharper wide open, but softer when stopped down to ƒ/11 or smaller. CA is noteably better, but again, the lens might perform better on a Panasonic body rather than the E-P1 we tested it on. Distortion is slightly better on the 14-42mm; the 14-45mm reaches 3mm further, but weighs 30 grams heavier. Both lenses offer Mega O.I.S. optical image stabilization, but if it matters to you, there's a switch on the 14-45mm to turn it off and on. If you'd rather have an all-in-one solution as opposed to the 14-42mm and 45-200mm combination, the Panasonic 14-140mm is an excellent choice; not quite as sharp as the 14-42mm when stopped down, but certainly very sharp through its impressive range of focal lengths. If you don't mind going off the Panasonic reservation, the Olympus kit lens would be an option: even lighter than the Panasonic (112gm), owing to its simpler optical formula. The Olympus 14-42mm tested very well, offering slightly sharper performance than the Panasonic 14-42mm, and better results for corner shading and distortion (though these results will probably depend greatly on the camera it's attached to). The Olympus lens doesn't offer optical stabilization though, and the retracting lens design is either loved or hated. Not much to add here that the tests don't already show: good sharpness wide open, and excellent stopped down a little. Given that it's the kit lens to a G3 package, you'll probably find yourself with one of these lenses just by buying into the system, and then it'll become a question of whether to stay with the kit lens, or buy something else. While you're deciding, you should be able to make excellent photographs. Lens buyed in kit with camera. An impressive image quality that can compete with some equivalent basic zoom lens kit provide with SLR (if we close at f/5.6 and f/8). Color rendering of the images is excellent. Excellent image quality in backlight condition. O.I.S. more efficient with the last lens update (V1.1). Very good sharpness at all focal lengths. Considering this is now the standard lens with many of Panasonic's newer cameras, it is really very good in terms of Image Quality through the entire focal length range. For the average user, this will be a nice starter lens for both still and video recording. I use it on my GF2 which makes for a nice light weight combination with a good focal range. It is also a good choice on Olympus M4/3 cameras especially for video as it focuses very fast and silently. Unfortunately, the OIS does not work on Olympus cameras thus the camera IS has to be used. This is fine for still shots and great for continuous AF in video but be aware of the "digital IS" of Olympus cameras during video recording.